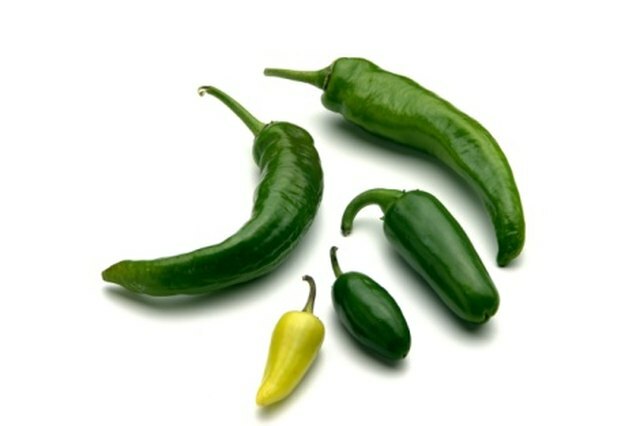 At 2,500 to 8,000 Scoville units, jalapeño peppers are actually at the milder end of the scale as compared to other peppers, such as cayenne or habanero. Although they are milder, they do have heat and some may prefer to tame the peppers, by removing the heat, before using them in recipes. In jalapeños, the heat is in the seed pods and in the membrane inside the pepper. By removing these parts of the pepper you remove a significant amount of the heat while preserving the flavor. Put on the latex gloves. The gloves prevent the oils in the peppers from getting onto your hands. Cut the tops off your peppers, and cut the peppers in half lengthwise. Use your fingers to remove the seeds and all of the white seed pod from the inside of the pepper. If necessary, cut off any remaining seed pod with the knife. Run the pepper under cold tap water and rub your thumb inside the pepper to break the blisters in the membrane. Rinse out the inside of each pepper. Put the peppers into a mason jar and pour the lemon-lime soda over the peppers. You may have some soda left over. 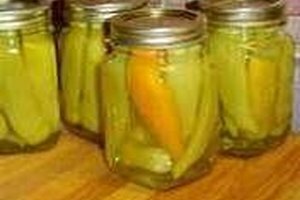 Let the jar sit for at least two hours in the refrigerator. The soda will absorb the remaining heat from the peppers. Remove the peppers from the soda and let them air dry. Dispose of the soda or store it in the refrigerator to use in a spicy marinade. 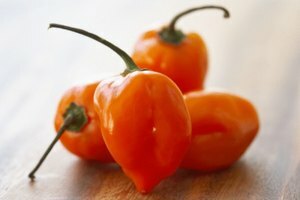 Avoid touching your eyes while handling hot peppers. If you must touch your face or eyes, remove your gloves first. If you accidentally touch your eyes, remove your gloves and flush your eyes with cold water. Andy Jackson has been writing professionally since 2010. He is a certified personal trainer and yoga instructor in Cincinnati, Ohio. Jackson is also a lifestyle and weight management consultant whose work has appeared in various online publications. He holds a Bachelor of Science in kinesiology and health, and a Master of Science in sports studies from Miami University in Oxford, Ohio.